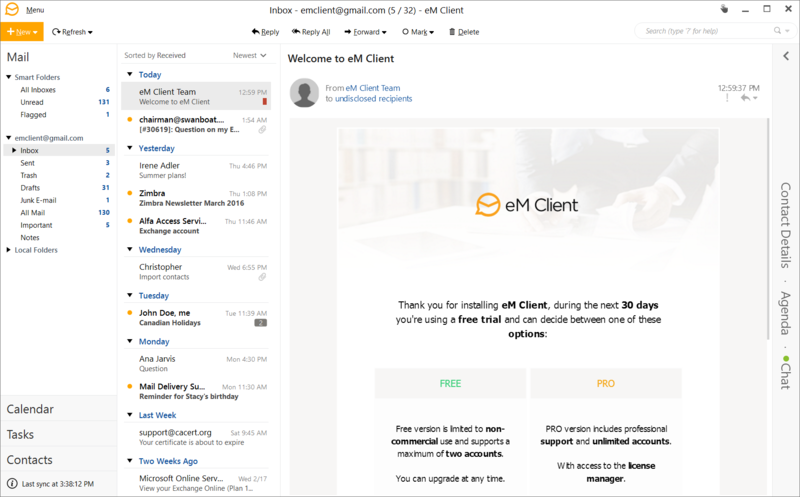 eM Client is a Windows based e-mail client for sending and receiving e-mails, managing calendars, contacts and tasks. It is being developed as a user friendly alternative to existing e-mail clients and Calendar solutions (MS Outlook, Thunderbird, The Bat). eM Client offers much more than just e-mails and calendars. It integrates Skype functions, RSS feeds and widgets. The Free version is for home use only and does not include VIP Support or Unlimited Accounts. They monitor you... they watch your emails to make sure you're using the free version, and if they think you're using the free license for anything but home use, they will revoke your license and render the software unusable. It happened to me while I was testing the software for our company. You should avoid this software at all costs for the simple fact that the phone home features means they're monitoring your email without your knowledge. By far the best Gmail integration of any email client. If you have a Gmail account then this is a must have. It only takes a minute to install and setup, so do yourself a favor and give it a try. Email, calendar, and contacts all sync with Gmail and I don't know any other email client that does that or with such simple setup. It also looks like they have great support for sync with other email domains like yahoo, aol, etc. but I haven't tried them myself. Quite smart solution. I find it much more user friendly than Outlook. Fully synchronized with gmail with skype and facebook integrated. The only problem is that it doesn´t support blackberry. version 3 is just released. it looks promising but i still could not see threaded message view option. still using eM & thunderbird together. The publisher's description does this program no justice for future improvements. I recommend going to their site and reading up on what they plan to do. Some of the updates they're planning are going to be astronomical. If they pull through with most of them, they'll have more than a fighting chance in the e-mail client world. As of now, its just good, not great. I would also like to see control of the font. Having the capability to resize the font is important to me. Especially in the reading pane because us seniors can have problems reading small font sizes. Being able to adjust the font size in the reading pane with the mouse wheel would be a nice feature. Even Outlook does a poor job of controlling font size. Give us total visual control and make us baby boomers happy. We still comprise the largest demographic segment. I do like what I see so far and will definitely be keeping my eye on this one. Well done so far. I agree with ninjeratu's review. Everything stated is indeed a fact. I gave it a 4 because it implemented itself into Vista 64 with no hitch. Mail,contacts and cal came in fine for me. Fonting is not great, so I'll look to future versions to correct this. For me however, the major problem with this program was the backing up to .eml! Why? This too I hope will be fixed, or this programs adoption rate will not get far. Other than that, it is fast,small,lite on resources and mirrors Outlook without the hassles. 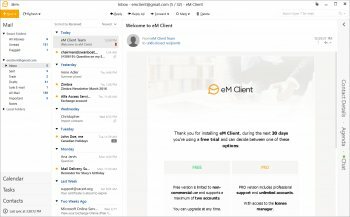 Never heard of this before, and I've been looking for a nice Outlook replacement for a long time. Anyway. Client says it's a beta for 1.1.2850.0, Web says 1.1.2 beta and the installer says 1.2. This is sort of nice. The install file is a little over 5MB, which is remarkable. There's also a version for flash drives. It's very much inspired by Outlook. Basically it's Outlook Light, complete with some of the layouts and most of the obvious visual stuff like columns and buttons. Not my problem, but I doubt Microsoft will allow this for long. I don't like the .NET dependency at all, but that could be me. You can import from many formats, but only export to .eml. Importing is also very slow (probably dotNET again). I had some issues with importing Contacts and Calendars from Outlook 2007, but none with email. Very limited options. Only the basic things can be configured. You cannot change font faces or sizes, for example, which makes it very ugly in my opinion. At least let me change to a sans serif font for emails. Right now it's pretty nice, but nothing I will switch from Outlook to. But I will certainly keep an eye on this in the future. Bottom Line: Works fairly well for accessing a gmail account. good outlook replacement if you can't use outlook.